This article is part of a year-long feature - watching and blogging about twenty acclaimed, cult, challenging and rare films over the course of 2013. The full list of films can be found here. Six: Carl Theodor Dreyer meditates on issues of faith in Ordet. One of the core reasons for this series of posts was to motivate myself to seek out the films of directors I hadn't gotten around or whose output I had only dabbled in. Most urgently among the auteurs I wanted to discover more about was Carl Theodor Dreyer. It's safe to say my viewing of The Passion of Joan of Arc late last year was one of those rare treats where you discover a truly beautiful, timeless film. With its provocative content and intense, close-up dominated aesthetic, it still feels vital and fresh on its eighty-fifth birthday. Perhaps the most striking first impression with Ordet is the deviation in stylistic identity from Joan. The close-up here is a rarely utilised indulgence - indeed, for the most part they are reserved until the film's closing chapters (a smartly disorientating trick similarly utilised in Mizoguchi's superb Osaka Elegy). Dreyer instead chooses to focus on wide-angled long takes that often last minutes at a time. When the film's singular 'montage' arrives, a segment that marks the transition into the breathtaking closing segments, its use of rapid cutting and swiping transitions actually comes as a bit of a visual shock to the system. The film's insistence on taking its time in terms of both narrative and cinematography has earned the film a reputation as being 'slow' in some quarters, but the results are bewitching - scenes radiate with both credible, slow-building emotion and proudly cinematic artificiality (Dreyer uses the story's theatrical origins to his benefit, keeping the action to a small number of settings that are often filmed as if playing out on a stage). If that sounds contradictory, rest assured that in the hands of a master director like Dreyer it is anything but. The story focuses on an extended Danish family - almost every member of which is in some way struggling with a crisis of faith, or at least a crisis facilitated by issues of faith. There's the loyal Catholic patriarch Morton (Henrik Malberg), his secular eldest son & his pregnant wife Inger (who mediates between sons and father), the youngest son who wants to marry a girl from a different Christian sect, and of course the middle son who has had a mental breakdown and now believes himself to be Jesus Christ. Through these and supporting characters - including the village priest and the doctor - Dreyer explores a host of different spiritual concerns, from mad, delusional possession to an unflinching belief in science & medicine. Ever the humanist, each character is convincingly drawn by the director (working from the original play by Kaj Munk), and he critiques and probes in an evenhanded, intelligent manner that never preaches. While it is obvious through this (and, of course, Joan of Arc) that Dreyer sympathises with a Christian viewpoint, his films in no way alienate those of alternate faiths. Indeed, through Birgitte Federspiel's Inger he primarily shows most allegiance to simple, honest human decency. A close comparison would be the later Silence of God 'trilogy' by Ingmar Bergman: three fascinating films that similarly explored questions of faith. In they're own way, all four films are determined by spiritual desperation and uncertainty. Dreyer also probes the strengths and weaknesses of organised religion - while many of the characters find great solace in their belief system, two young lovebirds are futilely kept apart by the minor deviations in the faiths of their respective parents. In Ordet, the great crisis arrives when Inger is taken ill during childbirth and eventually dies. The priest and doctor here represent the major conflicts at play - what is the role of religion and spirituality in an age of modern science and medicine? Can either be trusted? Characters experience a sense of hopelessness when neither successfully saves innocent, beautiful Inger. Like Bergman's infamously dark films, there's a sense of desperation as the characters struggle to retain their beliefs in the face of a great trauma (although ultimately it takes the tragedy for two stubborn fathers to realise the futility of their supposed differences). 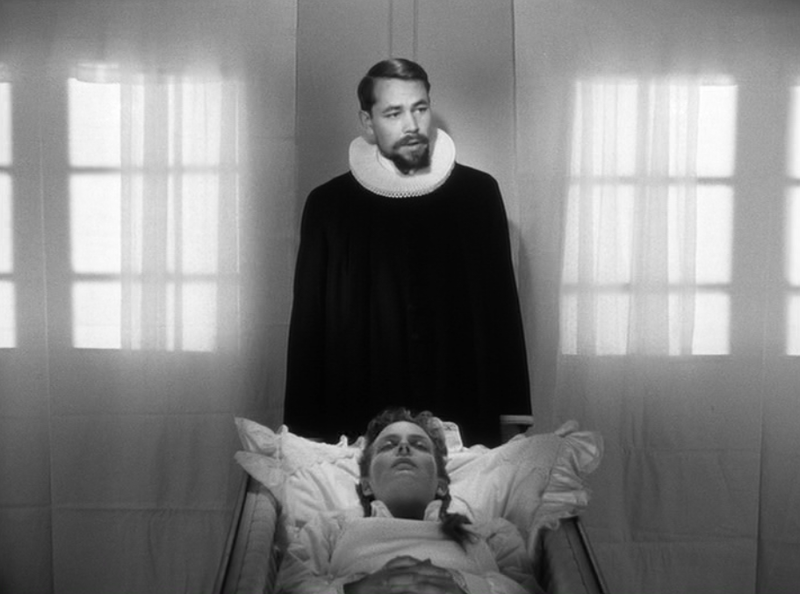 However, much like the poignant conclusion to Bergman's Silent Light, Dreyer leaves us on a note of optimism - indeed, it's a conclusion that is one of cinema's most breathtakingly beautiful, surreal finales. As 'mad' middle son Johannes (Preben Lerdorff Rye) regains his senses, Inger is miraculously brought back to life. For many of the characters, the great mystery is an affirmation of their belief and love for the woman. But Dreyer is perhaps suggesting something much more universal and resonant here - that perhaps the most wonderful faith of all is a belief in the (im)possibilities and emotional potential of art and cinema. A film like Ordet can only serve to reaffirm that belief.